New York will soon warm up to around 40 degrees. 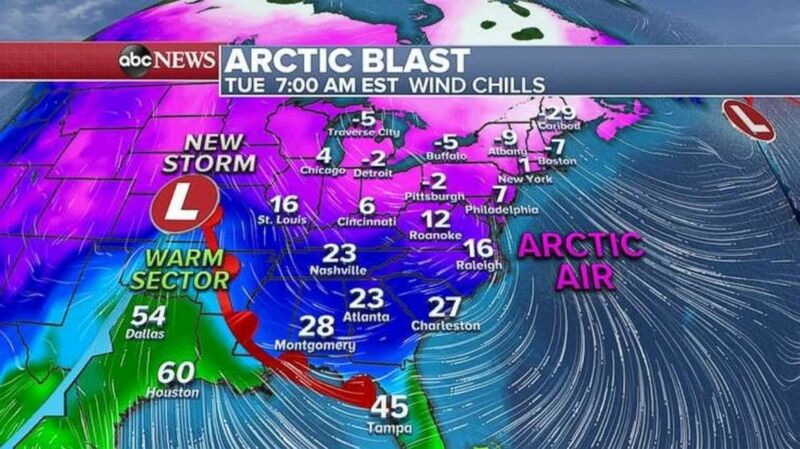 The brutal arctic air will soon lose its grip on the East Coast, while out west, a new storm is slamming the Rockies. Temperatures were brutal on the East Coast Monday, with wind chills reaching minus 30 degrees in Albany, minus 17 in New York City, minus 16 in Boston and minus 10 in Philadelphia. Over 10,000 Rhode Island residents were left without heat Monday night, the governor said, after gas was suspended to more than 7,000 customers "out of an abundance of caution due to a supply issue," according to National Grid U.S.
Rhode Island Gov. Gina Raimondo declared a state of emergency in Newport County and activated the National Guard to help residents. Raimondo said it may be a week or more until heat is restored to every customer. 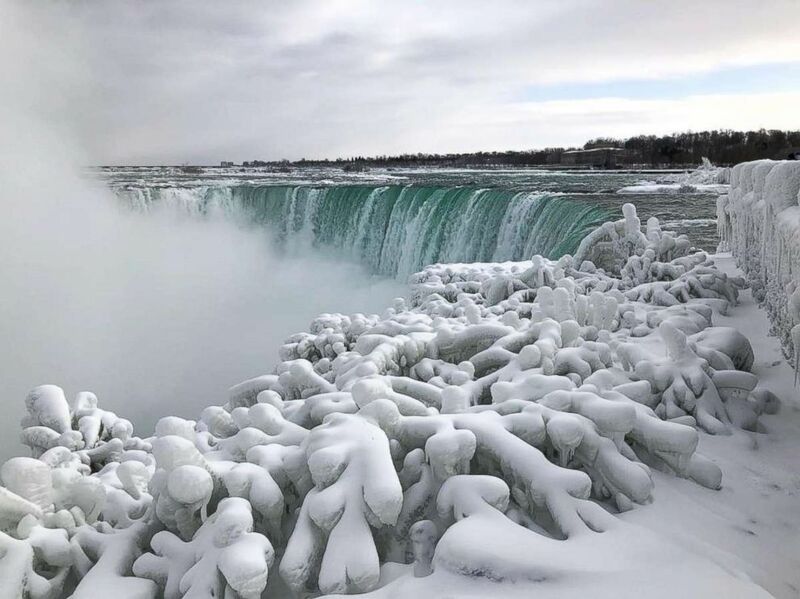 (Inge Groot/Instagram) Niagara Falls as seen from the Canadian side in Ontario shows signs of freezing during extreme cold weather, Jan. 21, 2019. East Coast firefighters have also struggled in the intense cold as they work to battle blazes. In Philadelphia, one block is "encased in thick ice" after firefighters used water to stunt a weekend fire that reignited on Sunday night, reported ABC Philadelphia station WPVI. New York City firefighters battling a blaze in Queens overcame "freezing, slipping hazards and getting hoselines in position" during the brutal cold, the FDNY said Monday. The aftermath of that fire left the street covered in ice. Much of the Northeast remains under wind chill alerts Tuesday morning. (ABC News) Wind chills in the East are still quite cold this morning. Wind chills were still near or below zero Tuesday morning in much of the Northeast, with the cold extending all the way into the Southeast. The intense cold should subside by late morning. A new storm developing in the central U.S. is forecast to move north into Canada, and, as a result, the warmer section of that storm will overtake much of the East, pushing up temperatures over the next 24 to 36 hours. 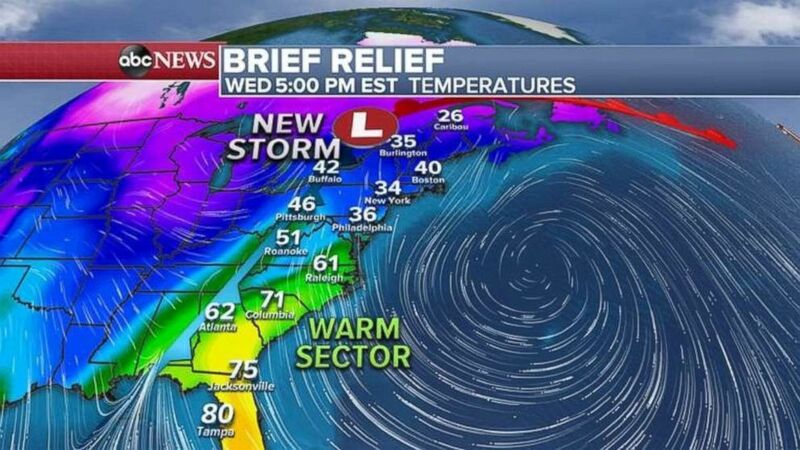 Tampa will see a Wednesday high of near 80 degrees, while New York and Boston will be back up around 40 degrees. (ABC News) Briefly warmer temperatures are expected Wednesday evening. 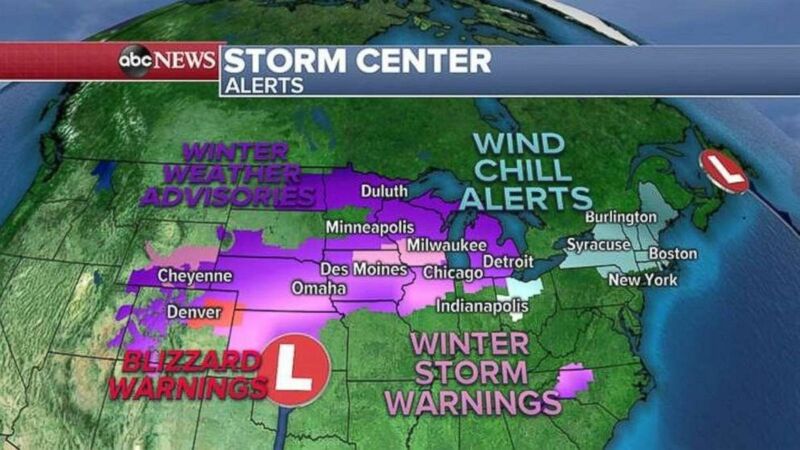 The Midwest is forecast to see brutally cold wind chills by the end of the week. 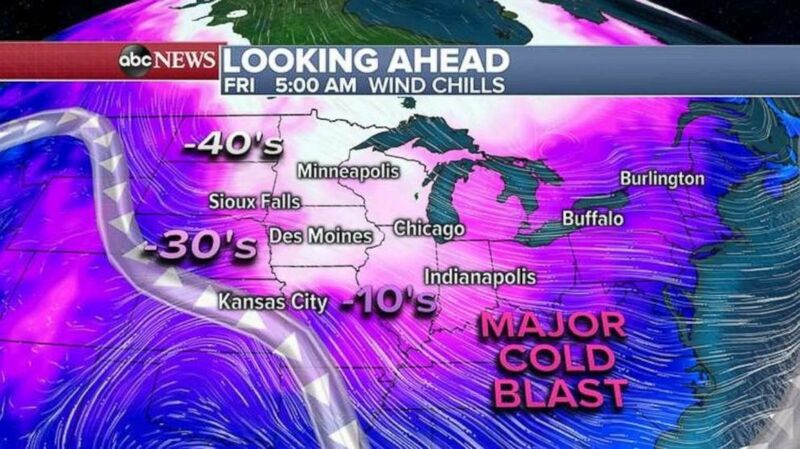 (ABC News) Another cold blast could shake up the Midwest by Friday morning. 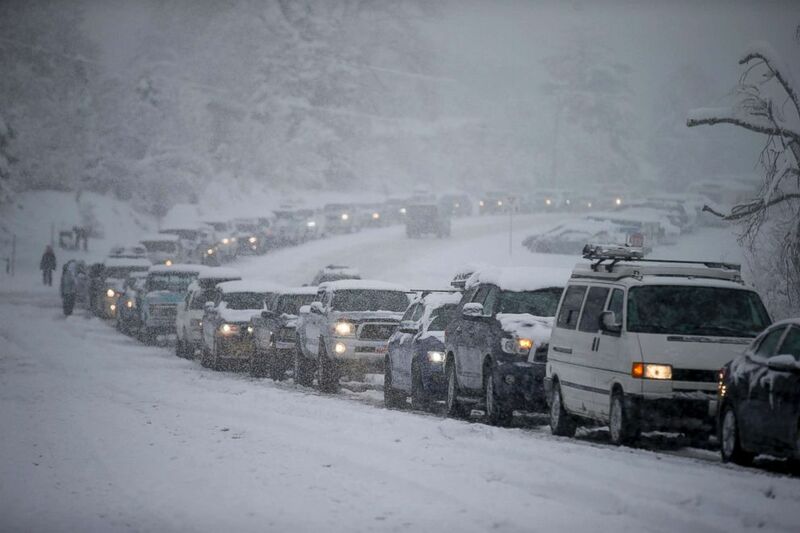 (Spenser Heaps/The Deseret News via AP) Traffic is backed up in all directions at the mouth of Big Cottonwood Canyon, west of Salt Lake City, as the canyon experiences intermittent closures during a winter storm, Jan. 21, 2019. 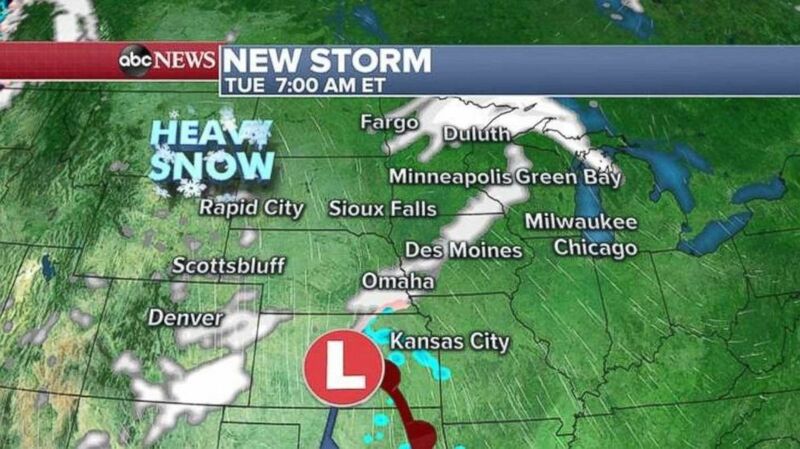 A new storm is bringing snow into the Rockies and the upper Midwest. Denver saw near-blizzard conditions Tuesday morning with wind gusts over 40 mph and near-zero visibility. (ABC News) Multiple weather and wind alerts have been issued this morning. (ABC News) Parts of the upper Midwest are seeing heavy snows this morning. Throughout Tuesday, bands of heavy snow will be moving into the northern Plains as well as parts of Iowa, Minnesota and Wisconsin, with snowfall rates of more than 1 inch per hour possible. By early evening, snow may just barely reach Chicago, dropping in bursts during rush hour. 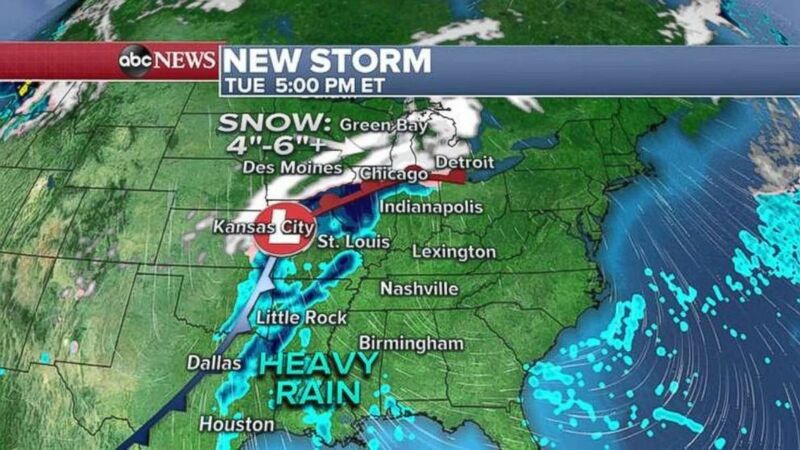 (ABC News) The new storm is forecast to deliver heavy snowfalls and rainfalls to much of the U.S. The snow is likely to last through the night in the upper Midwest, with the heaviest totals from Iowa to Wisconsin, with more than 6 inches possible locally. Heavy rain also is expected from Texas to Ohio, with localized flooding possible. 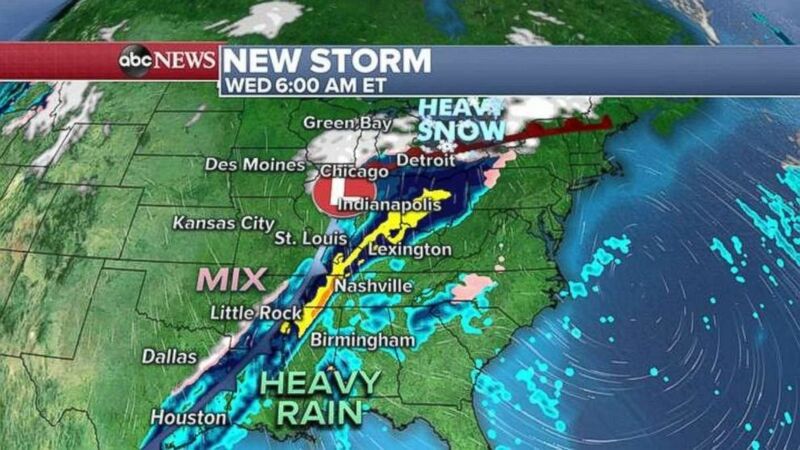 (ABC News) The new storm is forecast to deliver heavy rainfalls to much of the U.S.
With colder air traveling behind this storm, the parts of the southern U.S. may see a wintry mix on Wednesday and into Thursday. With the storm pulling milder air into the eastern U.S., precipitation in the major Northeast cities should stay as rain, not snow.